What started as a heartless prank by bullies turned into a heartwarming story demonstrating the healing difference friendship and kindness can make. 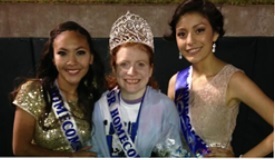 After learning that 17-year-old Lillian Skinner was falsely told she'd been nominated for homecoming queen at Grand Prairie High School in North Texas, two of her good friends made a pact. Anahi Alvarez and Naomi Martinez, who were actually nominated, decided that if either of them won, their friend "Lilly" would receive the crown. So when Anahi was announced as this year’s homecoming queen, imagine Lilly's surprise when her friend instead crowned her and called her the real winner. For Lilly, it felt like a dream come true. As her other friend, Naomi, put it: "Seeing the look on her face and the way she reacted toward it was priceless." And it was Lilly who has a lasting message for us all when she said afterwards: "My mom tells me, and I remember to tell my friends, 'Look inside to see what counts.' Not the outside. Look inside your heart." Good for You to Anahi, Naomi & Liilly for reminding us what it means to have friends you can truly count on!